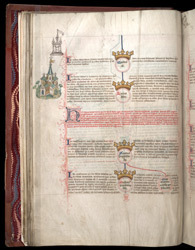 Taken from Elmham's 'Chronicle', this manuscript illustrates the genealogy of the kings of England, with a symbolic view of Colchester, Essex, depicted at top left. Elmham who compiled the 'Chronicle' in 1416 ("fourth year of Henry V", in the inscription), became prior of Holy Trinity, Lenton, after leaving St Augustine's, Canterbury, a few years earlier. It told the stories of the kings of Britain from Brut (the first king, who came from Brittany) through the Anglo-Saxons and Conquest to "the present day".